ENDERES TOOLS IS UNDER NEW OWNERSHIP!! My name is Steven Overgaard the new owner of ENDERES TOOLS, now known as Northbridge Tool LLC. While the name of the company has changed, rest assured the ENDERES TOOL name, which is stamped on every tool, and the quality associated with it never will. As the owner of Vasco Inc, a family owned machine shop, metalworking and fabrication facility located in Albert Lea. I have had a 30 year relationship with Enderes Tool, repairing and rebuilding their manufacturing equipment. This put me in a unique position to step in and rescue a valuable company in difficult financial trouble. We purchased all assets of Enderes Tool and hired most of the former employees. Unfortunately this process could not be completed before the company had to close it's doors. Enderes Tools reopened in November 2012 and is now running full speed and expanding daily. We are forging ahead with plans to move into a new facility, which we already own, enabling us to double the size of our current operation. We believe that our "commitment to quality" offers the greatest possible value to our customers and will provide the best opportunity for continued success. To this end we dedicate our entire effort. Please join us in the rebirth of this company and pass the word that ENDERES TOOL is still here and the best made tools in the world are still available. REMEMBER, price is forgotten when a tool fails to hold an edge, chips or breaks. Even if you never put your tools through a test like 1/4" Angle Iron (shown above), isn�t it nice to know the quality is there for the tough jobs. Especially when it costs just a few cents more. 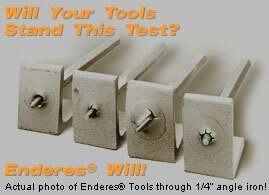 ENDERES TOOLS� GUARANTEES . . . all their tools to out perform the others. We give a full replacement guarantee if one ever fails its designed function. So, when spending money on Struck Tools, spend it wisely!